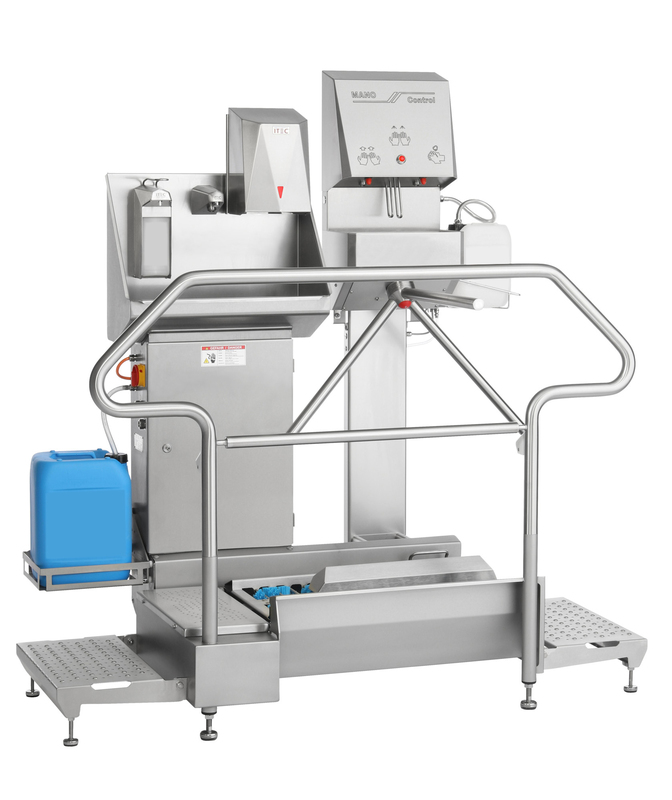 The new Hygiene Station type 23876-800 | Sulbana AG – Käserei-, Hygiene- und Verpackungstechnik. The innovative walk through system allows a controlled personal hygiene at the production access through a systematically arranged process sequence. The consistently implemented modular concept offers a wide range of customisation possibilities. The base features a continuous flow system with an 800-model shoe brush. 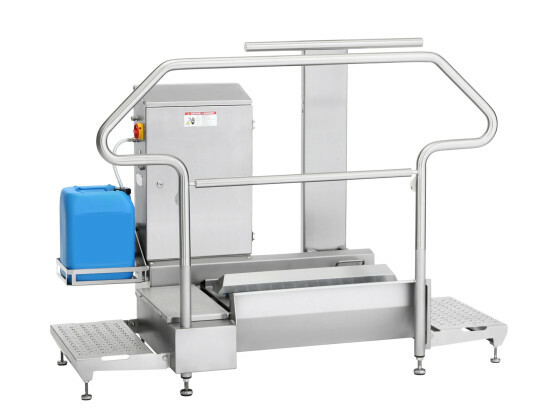 This can optionally be equipped with a motorised or mechanical turnstile, MANO Control module for contact-free hand disinfection, cleaning basins, various soap dispensers or a hot air hand dryer. 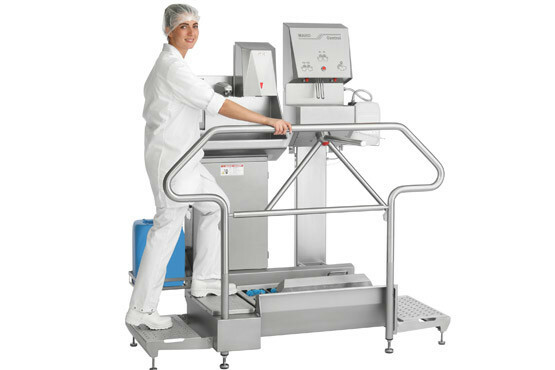 The hygiene station can be individually adapted to your specific operational requirements. Water and cleaning agents are supplied to the brushes by separate nozzles, thus avoiding mixing of the chemicals with the water network. 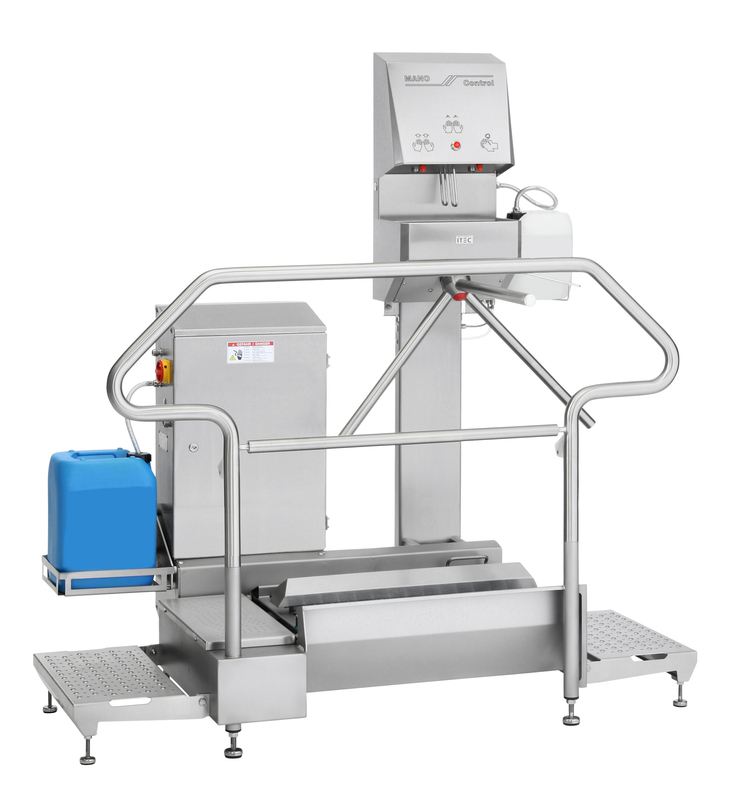 Automatic disinfecting agent dispenser Mano Control Type 23745 with motorized 3-arm stainless steel turn-bar for a safe, non-contact and obligatory two-hand disinfection. 800 mm long, sturdy and high-quality roller brushes ensure the cleaning and disinfecting of the soles. The average brush life is longer than 5 years. A safe and ergonomic overflow of the units is ensured by the use of steps, handrails, treads, non-skid surfaces and SAFETY GRIP handrails. The brushes can easily be removed for the cleaning without any tools. Hygienically open design for a fast and effective cleaning of the system. Sensor-driven tread grids and a 24V control voltage guarantee a high safety standard. Plug-in railing and superstructures for installation in buildings with narrow door widths. For further information, please do not hesitate to contact us by telephone or ask us for a visit at your place. Our Hygiene Technology department is looking forward to your request.